The nun monastery Hirova is dedicated to Saint Simeon Stylites. It is placed in the village of Neculaieuca from the raion of Orhei. The monastery is dedicated to the Ascension of Jesus Christ. It is placed in the commune of Chiţcani, in the raion of Slobozia, near the city of Tighina. Because the monastery is only at 4 kilometers away from Tiraspol, it was occupied by the separatist forces from Transnistria. The monastery of Noul Neamţ was established in 1861 by Andronic Popovici (former prior at the hermitage of Sihăstria and than at the monastery of Secu in the Mountains of Neamţ). 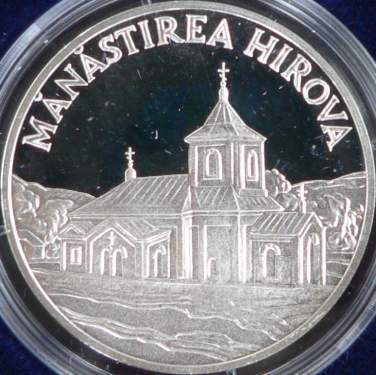 After the secularization of the monasteries' properties in the Romanian Principalities under prince Alexandru Ioan Cuza, Andronic Popovici together with some monks went to Chiţcani, in Basarabia (occupied in 1812 by the Russian Empire), to an estate owned by the monastery of Neamţ. After the approval of emperor Alexander II in 1864, in 1867 the constuction of the monastery of Noul Neamţ (meaning New Neamţ) began. In the monastery are observed the rules of Mount Athos. In 1912 the great belfry was erected by architect Alexander Bernardazzi. The belfry has 5 floors and over 60 meters in height. The larger bell alone weighs over 8 tons. In 1912 the cathedral of Saint Mary was finished. The monastery has four churches. In 1939 the monastery was renamed Saint Monastery "Patriarch Miron Cristea". (At the request of monks, due to the fact that the Patriarch was grand grandson of holy monk Teofan Cristea, founder of the monastery along monk Andronic.) It was closed in 1961, being transformed into a sanitarium for treating tuberculosis. The belfry was transformed into a museum. The monastic life was resumed after 1989. 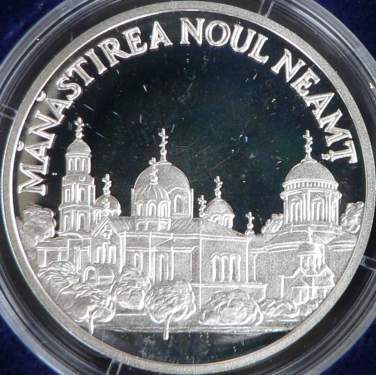 On the coin the belfry and two of the monastery churches are represented. 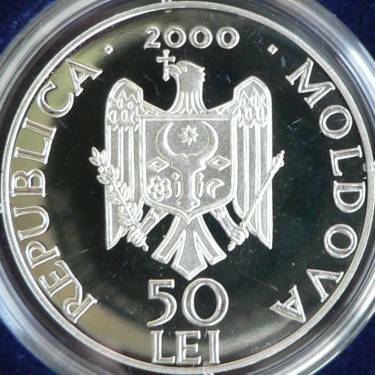 A picture of the Ascension of Jesus Christ cathedral from Noul Neamţ appears also on a coin of 100 roubles from the church coin set issued by Transnistria in year 2001.